Here in Ohio, we have entered "testing season" ... ahhhhh, the smell of spring in education. Leading up to this, I've been going into classrooms and going over the test tools - which, while helpful, isn't the most fulfilling experiences for myself or the students. I know it's an important and helpful time - I never want the tools to be hurdles for the students. I want the students to be comfortable with the tools and how to use them so it's not a problem when it comes to the test. Now for the upcoming weeks, my classroom visits will consist of "fun" activities. Trying to balance the focus of testing with lower key - yet still learning rich activities. I can't take credit for the basic idea - but I've taken some good ideas and made them my own. Both of the activities I share below can be used at ANY point in the year, as well as provide students an opportunity for "freedom" when there is time in your schedule. Both activities can support classroom activities if you are willing to stretch your thinking and allow students a bit more creative stretch. I never claim that my activities are perfect, and often, I leave a classroom with a post-it note full of ways I can improve, adjust, add or subtract, or otherwise alter the activity. What you see below is version 2.0 of both. I created them & went into two separate classes, and walked out with my notes. I spent some time this weekend - around my daughter's soccer tournament games - adjust and updating. As always, please take what you find, and modify it to better suit you and your students. Leveling Up with Pixel Art in Google Sheets ↬ a 2nd grade teacher asked me to come in and show his students pixel art. We did it last year and his students enjoyed it very much! (Several of them have reminded me of that this year as 3rd graders.) I decided not to reuse last years activity from Eric Curts "Pixel Art Activities for any Subject with Google Sheets" (it's a really good one to use!). I wanted to create something for 2nd graders that would allow an easy entry along with leveling up a bit, while at the same time being able to teach a bit of Google Sheets. I'm happy with the results and judging from their reaction, they were too! Here is the link to a "preview" of "Level Up with Pixel Art in Google Sheets". When you click on the link, it will open in "preview" mode ... you can view pretty much everything, and if you like it, click the blue Use Template button in the upper right corner. It will make a copy in your Drive for you to use, modify, and share. How Might You Use It? 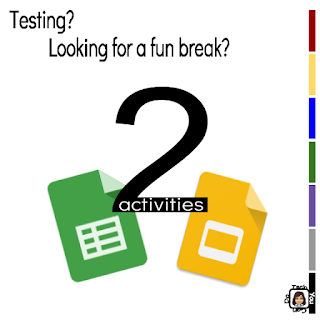 free "play" - since it's testing season for us, it's nice to have something that is incredibly fun and very open-ended, while at the same time, I can introduce vocab with Google Sheets and some of the tools. Math - pixel art is a GREAT opportunity to work with fractions. Depending on the age of your students, you could outline a chunk of cells, and then allow them to fill them how they choose, and write out the fraction for each color. Perimeter and area are other possibilities. ELA - students can draw "pixelated" images of characters in a story either that they have read or are writing. Last year, I worked with a 3rd grade teacher and we used "Pixelated Book Covers" that her students used and produced some pretty amazing book covers! History - while it won't be super 'realistic', students could use pixel art to recreate a battle scene or a historical character or event. With the unlimited space a Google Sheet provides, the only limitation would be time and creativity. The cells can be sized as large or small as the artist wants. Science - for scientific equations, color could represent various elements, and then color can be used to demonstrate the balancing. Ok ... maybe I'm stretching a little, but here's where science teachers can lend a helpful hand! Pattern Block Fun ↬ 4th grade is a regular appointment for me. I love working with these students - they have a solid understanding of the basics and are excited to learn more. This past week, I used a very familiar tool - Google Slides - in a different way. I inserted pattern blocks - a digital version of the manipulatives they use in math class. A couple of "How To" slides at the beginning provide some basic "helps" they can refer to at any point. There are simple directions on each slide providing a variety of tasks. This was a fun activity that I did not do a lot of whole group instruction - I gave a brief overview and they were off! One of the coolest parts to activities where it is more free play, the students discovered and shared what they found. I loved hearing, "Hey, how did you do that?" and "Wow! Look at hers! I wonder how she did it?" ... and then watching them teach each other. I added a few slides in afterwards to challenge students to use the shapes to create the designs I did. And just like pixel art, this is an activity they can come back to over and over. Once students have their won copy, they can make copies of slides and allow their creativity to run wild! 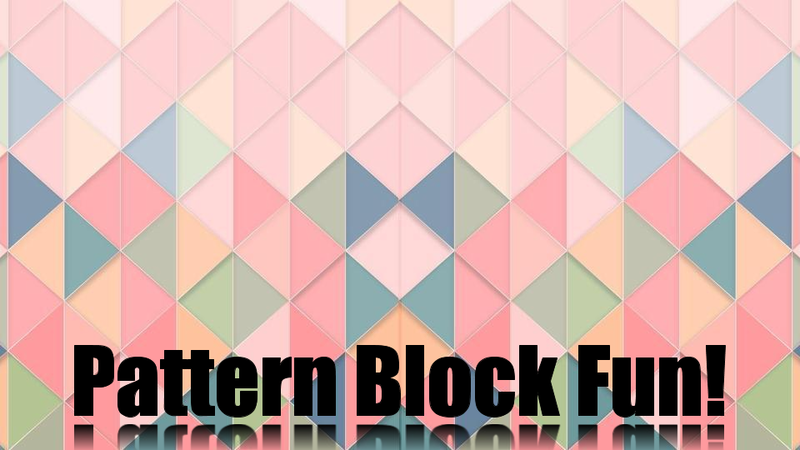 Here is the link to a "preview" of "Pattern Block Fun (in Google Slides)". Same as above, when you click on the link, it will open in "preview" mode ... you can view pretty much everything, and if you like it, click the blue Use Template button in the upper right corner. It will make a copy in your Drive for you to use, modify, and share.